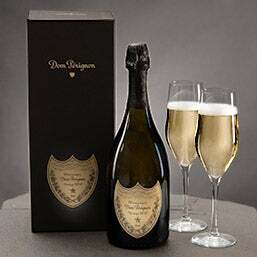 The perfect wine gifts for all occasions. 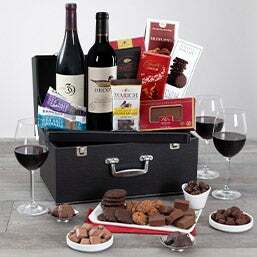 Take the guesswork out of gifts for wine lovers. 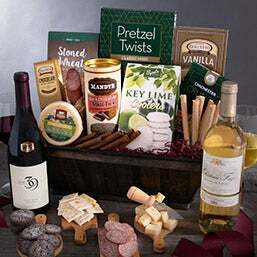 Leave it up to Gourmet Gift Baskets who have expertly crafted our wine gift baskets with popular and unique wines. 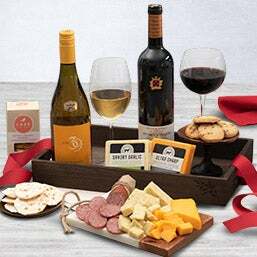 We have paired the best wine gifts with high-end cheese to create the ultimate wine and cheese gift baskets. 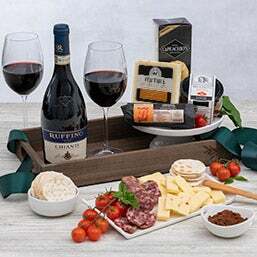 Robust cheeses and gourmet goodies for a level of classic sophistication that is unparalleled. 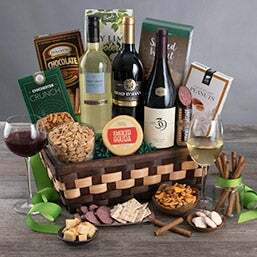 All of our wine gift baskets are delivered for convenience, and feature items to please the casual wine drinker or even the biggest of oenophiles. Love wine but have a problem with telling the difference between cabernet and merlot? We’ve got you covered. 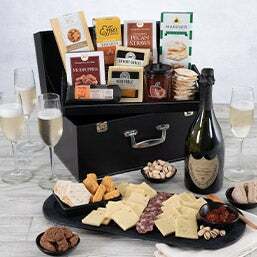 The rare wines in our collection come from some of the most famous wineries in the world and are expertly paired with gourmet snacks for both the casual wine lover and wine connoisseurs alike. 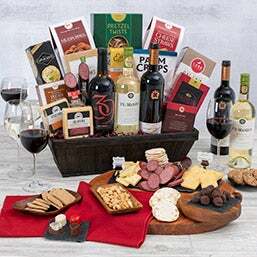 You’ll look like a wine aficionado by gifting our elegant wine gift baskets, handcrafted with superior quality wines, cheeses, food, ingredients, and fast delivery options. 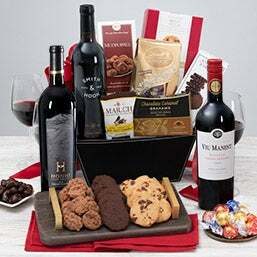 Get gifts for wine lovers of all varieties. 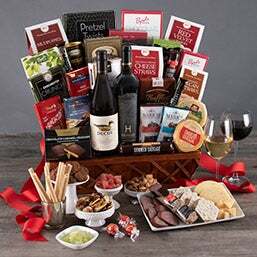 Congratulate them on a job well done, or add the perfect capstone to a completed project at the office with a corporate gift basket full of artfully arranged gourmet snacks and aromatic wines. 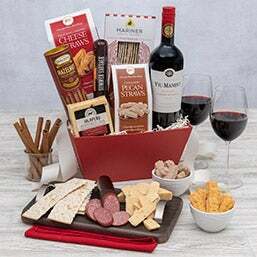 You may also consider a gourmet wine and cheese basket for the best of both worlds. 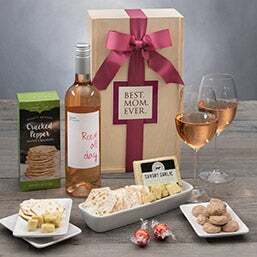 Give mom what she really wants for Mother’s Day....a wine gift basket! 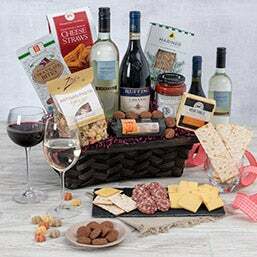 The homemade crafts are nice, but what she really wants is a gourmet wine gift basket filled with the gourmet delicacies that pair excellently with our exceptionally chosen wines. 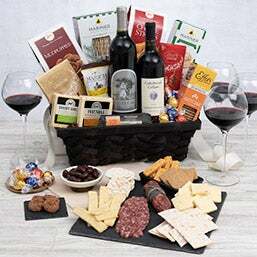 Our Gourmet Gift Basket wine baskets are guaranteed to make this Mother’s Day more special than ever. 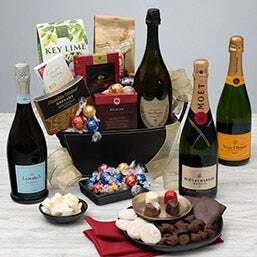 They’re sure to be yours when you send one of our gourmet wine baskets this Valentine’s Day. 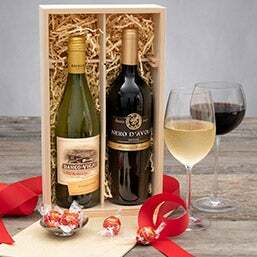 Stocked with only choice reds and coveted whites, our baskets have been putting cupid out of business for nearly a decade. 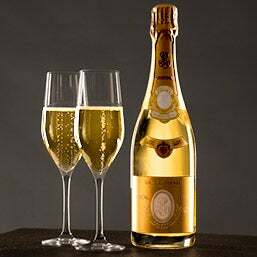 Cheers to however many years! 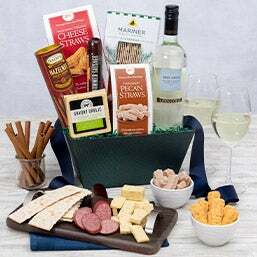 Wine gifts for the anniversary that is coming up as our wine and cheese gift baskets are always an excellent choice. 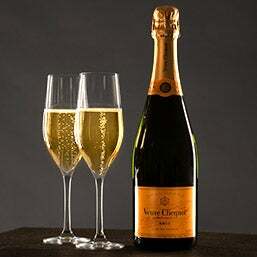 With our selection of champagnes, reds, or whites, you’ll make it a year to remember. Ancient History of Wine - Wine dates back to about 6000 BCE…and that’s like 2 thousand years before the wheel was invented. Check out the amazing and really cool history of wine!